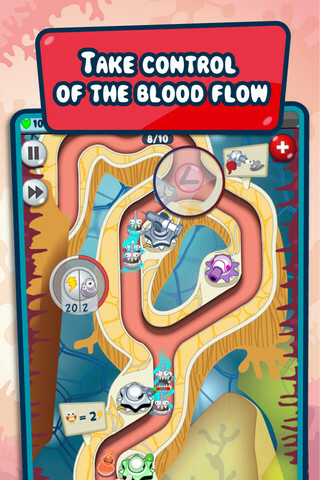 'Operation' meets tower-defense in Heliceum's new game. It wouldn't take too long to rattle off a list of entirely unique settings taken on by the ubiquitous tower-defense genre, but we've yet to fend off the greater dangers presented to a man's internal organs, and so for that we begin by taking our hat off to developer Heliceum for bringing something genuinely, er, fresh to the table. 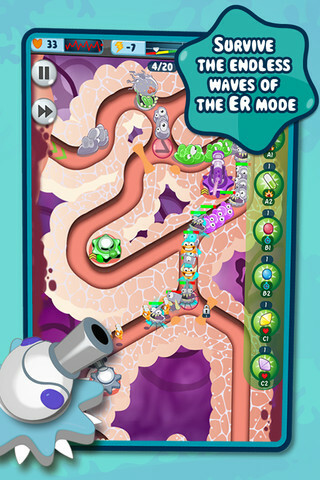 Each level starts off with a quick overview of the offending passage that passes through the patient's body, where you'll have to place turrets, antibiotic squirting syringe turrets and so forth. As well as the predictable bug-squashing of the invading viruses, you'll also need to manage the switches which allow you to divert enemies towards different parts of the body. Let too many of them pass through, and you'll both seriously damage your patient (eventually towards death) and screw up your points modifier which rocks precariously at the top of the screen. Once you've placed your various units across the map, they don't come to life automatically. Instead, you'll need to bring them to life by diverting the friendly proteins and carbohydrates that occasionally enter the body towards them. Once a specified number have filled the unit, it pops into action and the rest of your friendly units move on to bring any other weapons to life further on down the line. Either I'm rubbish at tower-defense games (quite possible) or the game offers up just a little too much complexity in its early stages. You'll find yourself juggling with items named Lymphos and Phalagos towers, or Valotus germs and it can be hard at first to keep track of which items interact with which others, and how exactly they do that. 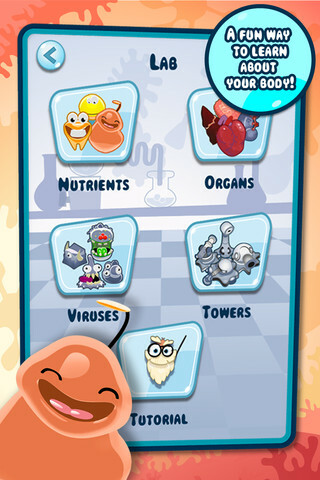 Handily, the developer has included a Lab section on the main menu so you can browse through the various proteins, viruses and offensive units to understand how they all feed into one other. Enemy units also mutate over time and become more resistant to your defenses, so it's safe to say you're going to be kept on your toes for some time. If it does become a little too much, then you can always use the currency earned through gameplay to pick up some performance boosts. You can, of course, also choose to spend some of your real-life, hard-earned money to help you on your way to success. 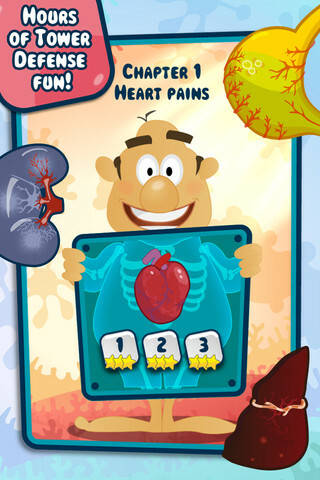 The chapter selection screen focuses on a different part of our unfortunate patient's body, from his heart, to his lungs, to his enlarged spleen. Our naked victim gingerly holds up an X-Ray plate that represents each chapter, and as you slide between them he blushingly rushes his hands downwards to cover up his more delicate areas. A nice touch and one of only a handful of genuine laugh-out-loud moments we've had on the App Store. I find myself a little bit torn when summing up Human Defense: it's a lavishly produced game that offers up plenty of depth in an undeniably saturated genre. On the other hand, I found it a little bit unfriendly in the way it reveals its mechanics. How would we sum up then? Well, if you're a tower-defense nut then we can't help but feel you haven't been properly challenged until you've taken this title on. If you need a little more hand-holding in your game progression though, Heliceum's game may just be a little too impenetrable to hold your attention for long. What's Hot: Great production values, some genuinely funny humor and a hefty challenge. What's Not: The learning curve could be more refined.